Yesterday we were rather concerned about two of our girls. 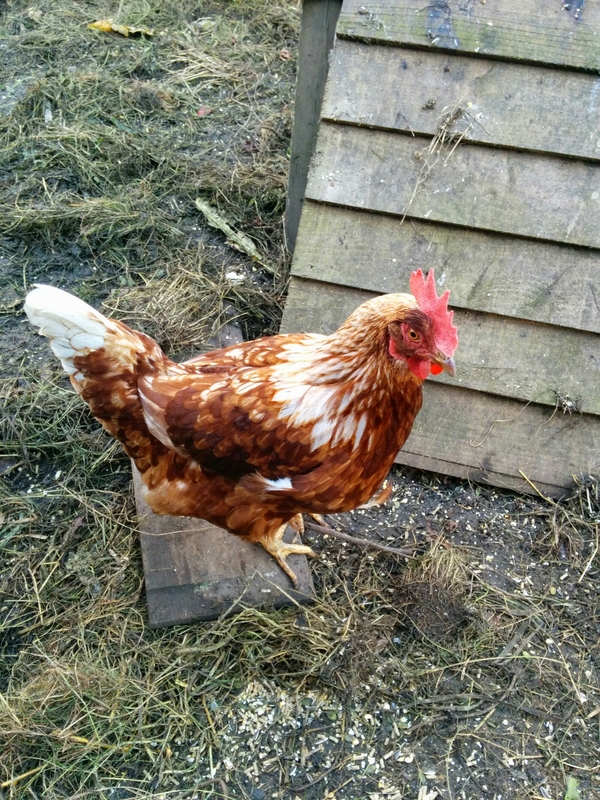 Lottie seems to have lost an unseemly amount of feathers and was sneezing often. We got Chris the Warden to look at her and he said she was fine – the reason why she was so bald is that her new feathers hadn’t fully grown in yet. Betty was another worry. When picked up she was sick and she seemed uninterested in food or water unlike Lottie who was scoffing as per usual. Again Chris was card and her suggested it might be better to put her out of her illness. And offered to do it. We said no but we would see how she was over the couple of days before deciding to put her down. It was such a shame as her eye had cleared up completely thanks to Cliff the Chicken Vet. This morning I went down to the coop and counted 6 chickens. Assuming the other two were inside I collected the eggs and played find the chickens. Again I came up short, although only by 1 this time. Where was Betty? I searched the coop and noticed the gap under the coop door was significantly bigger and there were lots of Betty feather around the coop. Dreading what I might find I began to comb the coop and came across a rather grisly sight… Betty’s decapitated head. I freaked out somewhat, called the other half and went to bury the remains in the allotment. I then spent the next hour attempting to fox-proof the coop. Once a fox has worked out how to get a free meal, he will inevitability come back again. Using breeze blocks and wooden panel, I hope I have protected the rest of the girls for another night. Sadly as Betty was not very interested in food and was shunned by the others, she probably was late going into the coop last night. That probably did it.